Plagued by dreadful weather that saw a lot of ran make the Santa Anita track very sloppy, the Mandatory Payout of the Rainbow 6 fell far short of expectations on Saturday. With a carryover of $1.5 million, it was though that the total pool available to fans could have been as high as $10 million but the pool ended up at $5.1 million. With mostly favourites skipping their way through the slopt to win on the day, almost everyone cashed their wager – for just $296. At Gulfstream, the Rainbow 6 continues to carry over. Over $1.1 million carries into today’s racing after more than one winning ticket somehow came up with the sequence yesterday which included 29 to 1 Harvey Wallbanger, winner of the Holy Bull Stakes. If you had 6 winners at Gulfstream for its Rainbow 6 yesterday it paid $21,000. The Holy Bull, a 1 1/16-mile prep for 3-year-olds, was one of three very early Derby ‘prep’ stakes races that took place in Florida, New York and California. The Ken McPeek-trained Harvey Wallbanger was making his stakes debut in the Holy Bull while racing for the first time this year. In his most recent start, the son of Congrats – Adorabell by Distorted Humor captured a maiden special weight race at Churchill Downs Nov. 17 after starting off his career with three straight second-place finish for owners Harold Lerner LLC, AWC Stables, Nehoc Stables, Scott Akman and Paul Braverman. The colt, co-owned by Paul Braverman who raced horses at Woodbine last year with trainer Reade Baker, is from the mare Adorabell, whose own dam is Canadian-bred stakes winner Hear the Bells by Deputy Minister. At Santa Anita on a dreary, rainy day, favored Mucho Gusto was all business, as he rated kindly and exploded the final eighth of a mile to take the Grade III, $150,000 Robert B. Lewis Stakes by 4 ¾ lengths under Joe Talamo. Trained by Bob Baffert, the chestnut colt by Mucho Macho Man got a mile and one sixteenth over a sloppy track in 1:41.81. A comfortable third into and around the Club House turn, Mucho Gusto was well within himself as he stalked Magnificent McCool while second heading to the far turn. Five sixteenths of a mile from home, he took command and accelerated through the lane like a top Derby prospect to win with his ears pricked. 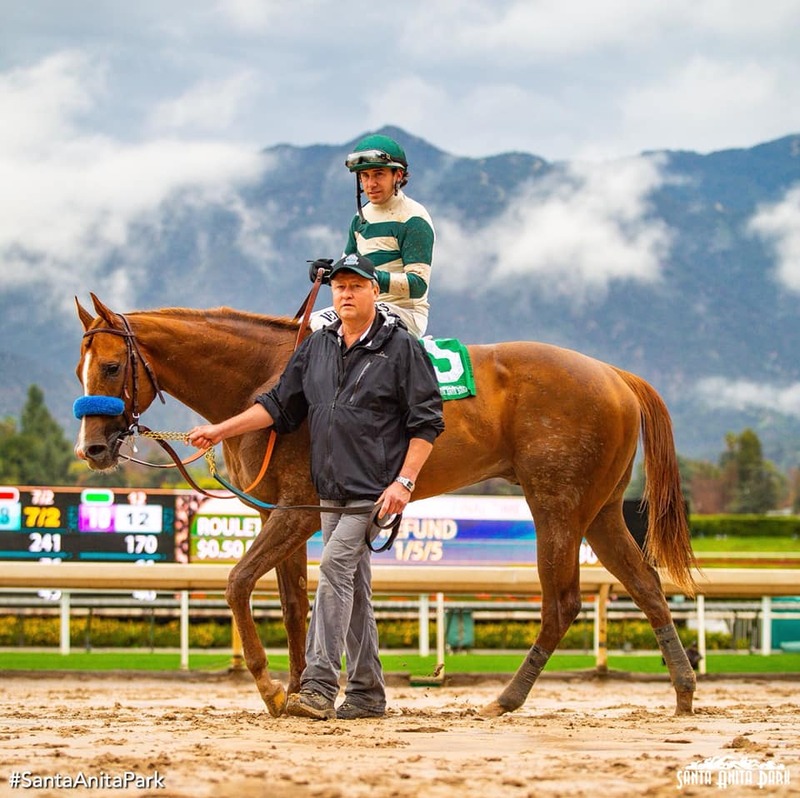 Idle since running second to his highly regarded stablemate Improbable in the Grade I Los Alamitos Futurity Dec. 8, Mucho Gusto, who is out of the Giant’s Causeway mare Itsagiantcauseway, was off at 3-5 in a field of five sophomores and paid $3.20, $2.20 and $2.10. Owned by Michael Lund Petersen, Mucho Gusto, who was purchased for $625,000 at a 2-year-old in training sale this past May, picked up $90,000 for the win, hiking his earnings to $234,000. He now has three wins from four starts and he picked up 10 Kentucky Derby qualifying points as well. “He got to sit off the pace, which was good,” said Baffert. “They have to learn to do that, and I was really happy with Joe. He rode him with a lot of confidence today, like he was a good horse and he (Talamo) was on his own. I didn’t give him any instructions…He’s a good horse. He’s a fighter, too. If they’d have hooked him, he likes to fight. 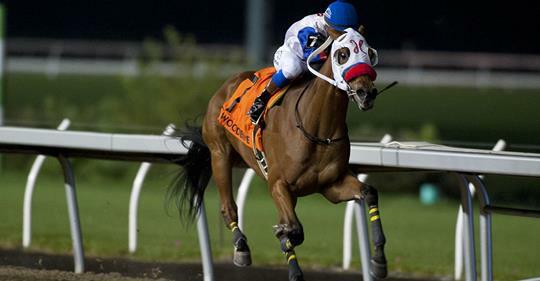 The 139th running of the Withers was the second of four races on the New York path to the Kentucky Derby, awarding Tax 10 qualifying points for the Run for the Roses on May 4 at Churchill Downs. Owned by R.A. Hill Stable, Reeves Thoroughbred Racing, Hugh Lynch and Corms Racing Stable, Tax broke from the inside post as the 2-1 favorite, staying off the pacesetter Not That Brady, who led the seven-horse field through an opening quarter-mile in 23.56 seconds, the half in 47.39 and three-quarters in 1:11.44 on the main track labeled fast. Out of the turn, Not That Brady maintained the lead as Our Braintrust challenged to his outside. The duo bumped slightly in the stretch while Tax, under encouragement from jockey Junior Alvarado, kept gaining ground from the inside, taking command near the sixteenth pole and completing 1 1/8 miles in a final time of 1:50.27, finishing a head of Not That Brady. “He ran really good today. I think down the backside, he got a really good education,” Gargan said. “Junior said he was really impressed with him. He said he kind of got stuck down in there and clipped heels a couple of times. Tax returned $6.20 on a $2 win wager. He more than tripled his career bankroll to $186,300 and increased his Derby qualifying points to 12 after earning two with a third-place finish last out in the Grade 2 Remsen on December 1 at the Big A. Tax has never finished off the board in four starts, notching two wins, a runner-up effort and a third-place finish. He has two wins in three starts going longer than a mile. Flashy MUCHO GUSTO, winner of the Robert Lewis Stakes at Santa Anita on Saturday in the slop, is one of those wild sales horses that blossomed from yearling to 2-year-old, going from few interested parties to a big ticket purchase. From the first crop of the Adena Spring’s exciting stud MUCHO MACHO MAN, Mucho Gusto was sold as a ‘short’ yearling at the Keeneland January Horses of Racing Age sale for $14,000 to Kelly Lively. In September at the Keeneland yearling sale, the colt was sold for $95,000 to S.R. Schwartz. The following spring at the March Ocala Breeders’ 2-year-old sale, the son of the Giant’s Causeway mare Itsagiantcauseway worked one furling in 10 seconds flat on a synthetic surface but had few people excited. He was bought back for $55,000. Incredibly, just 75 days later at the Fasig Tipton Midatlantic 2-year-old sale in May at Timonium, the colt worked 2 furlongs in a sizzling 21 1/5 in the slop for that sale. He then brought a staggering $625,000 at that sale from Michael Lund Petersen and was sent to trainer Bob Baffert. Kip Elser’s Kirkwood Stables sold the colt at the Maryland sale and said the colt blossomed before the sale. Heste Sport Inc.’s MY SILENCER, winner of the frost King Stakes in his career debut last fall at Woodbine and then 3rd in the Kingarvie Stakes,makes his 3-year-old debut at Gulfstream today in the Dania Beach Stakes. The speedy son of Silent Name (Jpn) is making his grass debut with loads of turf breeding. trained by Bill Tharrenos, the gelding has had 2 workouts since Kingarvie run.